Greetings, Friends. We interrupt the series on child-like faith (even though “getting ready to read” sounds like a child development topic..!) to bring a special announcement about the upcoming BIBLE READ-A-THON: two weeks of Bible reading from July 13-24 that will take us cover to cover through the Word of God. There are two purposes for this event. First (and as I realized last year, the most important) is to read, soak in and be washed with the Word of God. Beautiful! Powerful! Completely worth it! 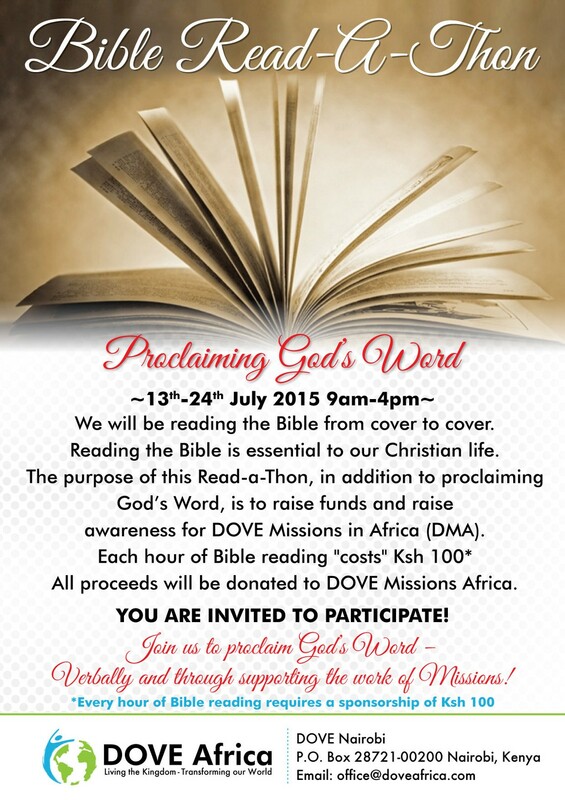 Second, the event is inspired by a desire to raise funds for the work of DOVE Missions Africa (DMA). Others might organize a ‘cancer run’ or a walk for some worthy cause. Using a similar concept, this is a ‘win-win’ activity, benefiting not only those who read or hear the Word, but also the work of missions in Africa. The neighbourhood also really appreciates the reading that goes out through a combination of the P.A. system and horn speakers. If you are far away over the ocean or across the continent, donating toward the cause of DMA. Sponsorship for Bible reading is 100 Kenya Shillings per hour (approximately $1.00 per hour). We welcome you to sponsor as many hours as you can, or give any amount. All of the proceeds will go directly to DMA. This entry was posted in Bible, Bible Read-a-Thon, Child-like, Inspiration, Missions and tagged Bible, child development, inspirational, missions. Bookmark the permalink.